Where does Fatal Discord rank among all the audiobooks you’ve listened to so far? What was one of the most memorable moments of Fatal Discord? As Luther defended his views of the Bible at the Diet of Worms, he declared in conclusion, "Here I stand. I cannot do otherwise." At least that's what we've always been told! Apparently, he actually concluded with, "Amen." But it's not as good of a story. 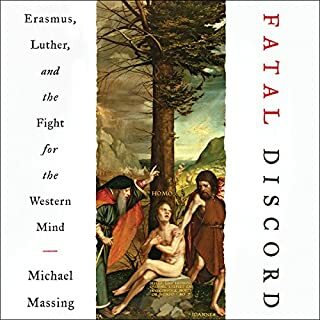 I enjoyed Erasmus the most, as his humanist vision was ahead of his time and he presented an appealing alternative to the rigid ideologies of the day that led so many Europeans to kill one another. While a very flawed person, the incredible, fearless courage Luther showed in his defiance of the Catholic Church was astonishing. He could have faced burning at the stake many times over; indeed, it is a fate numerous of his followers suffered. Yet the threat never caused him to moderate his unbridled attacks against the Church, showing both the courage of his convictions and the power that beliefs of whose truth one is utterly convinced can have over a person's actions.